This week’s profile comes from the local ‘Bike Guy’, a guy in town who sells bikes out of his basement (all 3 of my bikes have come from him, and countless friends). He is known as The Bike Guy, and we will keep his identity a mystery here! I was about 4 when my grandfather gave me a second hand tricycle, a Murray, metallic green with white trim. It was a little rusty and had a very squeaky front wheel that he never oiled because he figured I was safer that way. You could hear it coming a block away. It was the mid 60s and I was allowed to wander around our Woodlawn neighborhood without supervision. A year later he found a 20” bike with training wheels and weathered house paint. My dad, not to be outdone, got me a new bike for xmas that year. It was also a Murray, red with a tank and headlight. He was one of those kind of dads that pushes you in the lake to teach you how to swim, so the training wheels came off quickly and he gave me a running start down a big hill, reminding me as I started to pull away to pedal backward to brake. That mix of fear and excitement got me hooked, and I still occasionally get that feeling on the mountain bike. The old red Murray got stripped down to a bare rusty frame and wheels and I rode it for years. Last I remember we were using it for a dirt jumper and trail bike in 6th or 7th grade. By then I had a second hand orange metallic Huffy 3 speed bike that I rode thousands of miles on dry rotted tires and worn out block pedals. There were several other bikes in the garage through those years but sadly, this was by far the best. It eventually came with me to college after a makeover. I first became aware that cycling was an actual sport when we got cable TV. One day I was flipping through channels and came across the Tour De France. Prior to this I had been led to believe that a ball or shotgun had to be involved for something to qualify as a “sport”. I also became aware that there were better bikes out there than any I had ever seen. My first roommate was a serious cyclist. He had an old Raleigh beater with Campy friction components that he let me use for a while, a huge improvement over anything I had ridden before. After trying out a few newer bikes I bought an entry level Trek road bike, the best I could afford at the time. It wasn’t a very good bike so I saved some cash and traded it in for a Cannondale. It cost more than my car. I thought it would be the only bike I would ever need. A few years later mountain bikes came along. This was exactly the kind of bike I always wanted, the bike that the old Murray tried to be. Soon the Cannondale was only an occasional rider and I was spending all of my time trail riding. There were a whole series of bikes, some were broken, some worn out, some became obsolete. All were enjoyed. Around that time I bought my first antique bike at a flea market. It caught my eye because it was similar to the old Murray, but more deluxe and shinier with a big chrome front shock. While researching it I discovered that there was a whole other cycling culture out there. 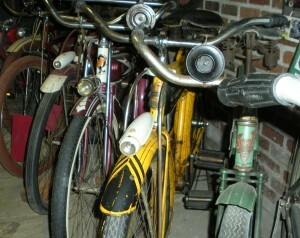 Actually several since like modern cyclists, the antique collectors are divided into subcultures. The Wheelmen only care about bikes made in the 1800s, the Sting Ray guys mostly stick to 20” bikes with stick shifters, balloon tire collectors like the deluxe cruisers. Even these groups have their subcultures. Since then my interests have changed several times and I have seen, studied, repaired, and ridden countless bikes spanning more than 100 years. Though I spent nearly half my life riding the worst crap that the department stores had to offer, I had just as much fun then as I do today. The best cyclists I know can jump on any bike and make it perform. Skill and finesse come from within, they are not generated by the bike. That’s not to say that quality is not important. A well designed frame with high-end components is a joy to ride and will greatly improve the performance of any level of rider but it is not a requirement to enter the sport. 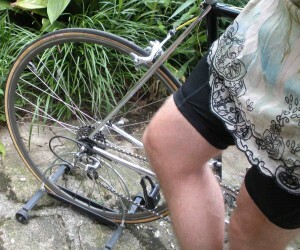 For the cost of a new entry-level bike the beginner can find a top-end used bike. Bicycle sales in the US first surpassed 1890s levels in the 1970s and have held steady since. The surge has brought a leap in technology and left a wake of debris in its path. The earth is littered with mass produced Schwinns of the 70s and Treks of the 80s that have fallen out of fashion. Trends and technology come and go in the world of cycling. The bonded aluminum Vitus of the 70s was state of the art in its day and can be found today next to the biopace equipped aluminum-lugged bonded carbon fiber Treks of the 80s at a yard sale near you. Today’s carbon fiber frames and electronic Dura Ace will likely follow that path. The perfect bicycle is the one that fits and performs to suit your needs. 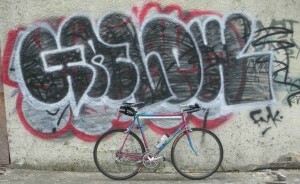 Look beyond the latest fashion and don’t listen to bike snobs. Find a bike that makes you happy and customize it to your liking. Name it after a rock star if you want. Remember there’s always something better out there, always more to learn. check out that skirt! ow ow!! Hey! This is a great idea! I´ve been learning a lot from your blog. reading you after following on twitter… Profiling common people it´s realy cool. I live in México but I really would like to appear there. 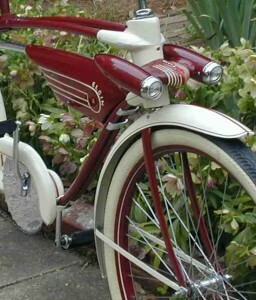 I still have my 1962 road bike, and I still ride it, too. He looks hot in a skirt!! !